This reading and listening exercise is about the Spanish New Year's tradition of eating twelve grapes at midnight. It is suitable for level B1 Spanish students. If you ever spend New Year's eve in Spain either at someone's home, in a bar or club, or in the streets, you will see this unique tradition of eating 12 grapes at midnight. It can turn a bit crazy at times, there's nearly always someone who gets confused and finds they haven't got enough grapes left or are still left with one or two when it's over! 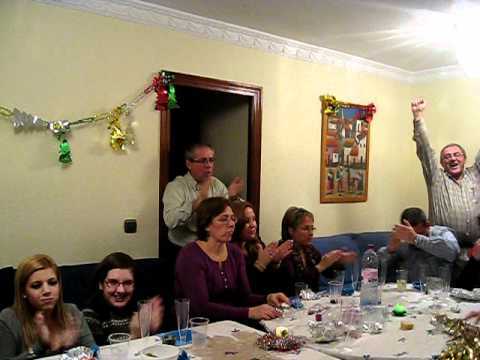 There’s a video below the “bilingual reader” so you can see what happens in a typical Spanish family home (but it’s not part of the exercise – it’s just for information). The bilingual reader article below was written and recorded by Kwiziq's Spanish expert, the ever-wonderful Inma Sánchez. Click play to listen to the article. You can read the transcript at the same time or after. Click any phrase for the translation and links to related grammar lessons which you can add to your Kwiziq notebook to practise later.